Serena Williams celebrates winning her Women's singles final match. 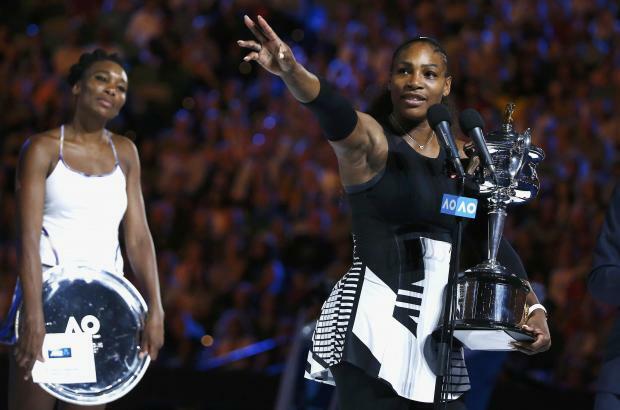 Serena Williams beat her sister Venus 6-4 6-4 in the Australian Open final to win her 23rd grand slam singles title and become the most successful tennis player in the open era. The 35-year-old American's victory gave her a seventh Melbourne Park crown and sent her clear of Germany's Steffi Graf at the top of the list of most prolific grand slam winners since the game turned professional in 1968. The second seed overcame a stuttering serve to take a topsy turvy opening set and one break of 36-year-old Venus's serve proved enough to claim the second after 82 minutes on Rod Laver Arena. The victory ensured Serena, who hit 10 aces and 27 winners, would regain the world number one ranking from Germany's Angelique Kerber on Monday.